Wouldn’t normally wear these together, but it was convenient to photograph them that way and the look surprisingly good. I’d just been dreaming about finding some wide-leg, high waist pants and more blouses . . . . . . . . . .
Love these! They both fit me really well and I’m already enjoying wearing them. The pants are Bobbie Brooks (always a reliable vintage find) and the blouse is by Mardi Modes New York. How cool is that?! A really neat feather print on the shirt, and nice colors. I wouldn’t wear the neckline in a frilly bow, but prefer a high-neck tie effect. The pants are just super-flattering and, with a navy and ivory coloring, are great with my pea jacket find. So, it keeps going on and on. What next? . . . . . . . . . . . . . . . . . . . . . . . . . . . . . . . . . . .
Couldn’t pass up this gorgeous mid-century silk scarf by Echo. That company always made scarves in the proper way – usually of silk, and with hand-rolled edges. Good scarves can still be found here and there (especially in Europe) but they are rare and ungodly expensive. Our female (and some male) forebears wore beautiful scarves and ascots regularly; sometimes as a part of their daily wardrobe and sometimes with dressier outfits – almost as standard as a hat. Every lady had several tucked into her top dresser drawer. European men wore them in place of ties. Although I love funny designs and little prints, this stripe is a classic and easy to pair with many basic black tops, dresses, jackets or coats. Of course, there are plenty of less common ways of wearing them – tied to a handbag or in the hair. Can’t have too many . 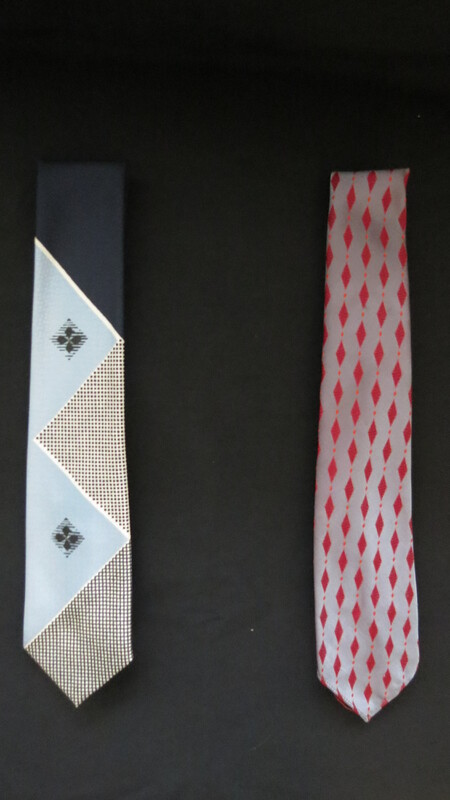 . .
Here’s a collection of neckties that span from the early ’50’s to the late ’60’s. Brand names include Wembley and others (which I’ve forgotten at the moment). Some are of silk, some of rayon blend and some of polyester. Although the widths vary a lot from decade to decade, I don’t think that I would let that keep me from wearing the one I wanted to if I were a man. They can all look sharp and interesting or fun. It’s not difficult to find these now. Once in a while I check for them. They even make nice belts for women’s clothing sometimes, and women did wear them as ties, too, in 1967 when the British Carnaby Street fashions were really in. You can wear a skinny one for an Annie Hall look, or whatever. 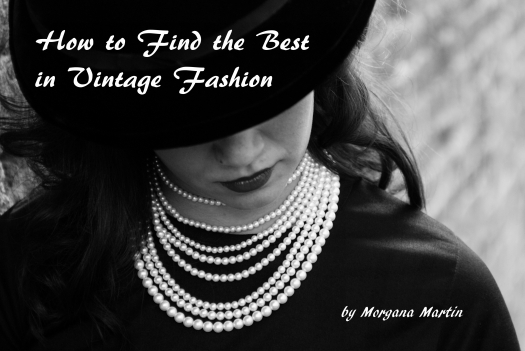 When it comes to wearing vintage fashion, anything goes . . . . . . .
Costume jewelry for the guys, though they may be sterling silver. Sets like this were standard dress-wear for men in the mid-century and before. These came through my family, but I always nab nice ones when I find them. They are by SWANK, in their original packages. The set on the left, with pearls, were sold at a hometown menswear store. The set on the right was packaged especially for a department store. Perfect with your ’50’s,’60’s or ’70’s dress shirt (and tie). MID-CENTURY FINDS ABOUND! TRUE VINTAGE MEN’S NECKTIES FROM THE 1950’S . . . . . .
MID-CENTURY FINDS ABOUND! TRUE VINTAGE MEN'S NECKTIES FROM THE 1950'S . . . . . .. I don’t have a huge collections of ties, nor have I been into wearing them or sewing with them (I guess I could get a lot more creative in that way). However, I always keep an eye open for interesting ones and don’t resist when I see them. These two are from the ’50’s or very early ’60’s. I love the medallion motifs and interesting geometrical shapes that were common then. Conservative and elegant but snazzy, too. Wow, that’s a word from that time that I don’t tend to use, but it fits. Men always seem to prefer blue, but I like the red . . . . . . .